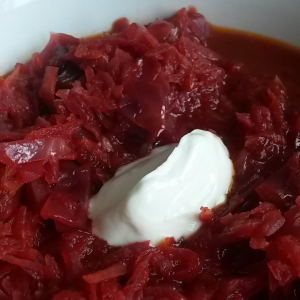 Melt the butter in a large saucepan, add the onion, garlic and beets, stirring to distribute evenly. Cover and cook gently for 10 minutes, without browning the vegetables. Once the vegetables have softened, add the cumin, cinnamon, tomatoes, tomato juice, tomato purée and vegetable stock. Cover and simmer gently for 15 minutes, until all the vegetables are tender. Remove from heat and add soy sauce. Taste and season further if desired.Blend until smooth with an immersion blender, or transfer carefully to a standing blender. The soup can be served chilled or hot. Serve on its own or with a dollop of yogurt and fresh coriander.